Without the slider, the Tycho parachute deployed flawlessly (Credits: Morten Bulskov). 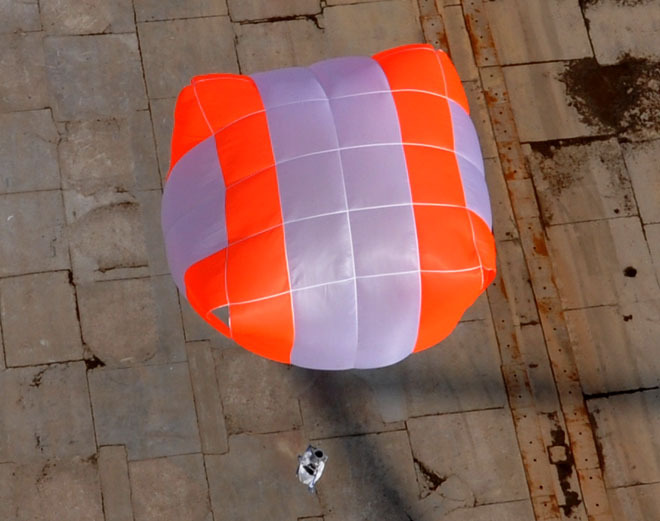 On March 17, Copenhagen Suborbitals performed the first drop tests on their main parachute for space capsule Tycho Deep Space. Although limited in height, the test was deemed a success. The drop occurred from a gantry crane providing an 89 meter drop. The distance was long enough to test the parachute packing and deployment configuration. It was not quite long enough to test the slider mechanism, used to control the canopy opening shock. The parachute, like the rest of Tycho, is a do it yourself construction of Copenhagen Suborbitals, co-founded by Kristian von Bengtson and Peter Madsen. They founded the company in 2008 with the goal of launching themselves into space. Subtitled “Absolutely No Rights Reserved,” the organizations aims to demonstrate an open-source non-profit alternative to the big government approach to space flight. The duo now have dozens of hardware tests under their belts and assistance from local volunteers and donors forwarding their vision.